This book was amazing! I thoroughly enjoyable read that meets all expectations. It was mysterious and creepy and I was always left waning to read on. As soon as I started reading I was hooked. Throughout the novel I was left in suspense and Jessie did a fabulous job of keeping my intrigued! The mystery was very well inter weaved and I really enjoyed the slow and unexpected revelation that followed. This brings me onto the plot. Just by the synopsis, I was curious and felt like this was exactly a type of book I would enjoy and boy was I right! 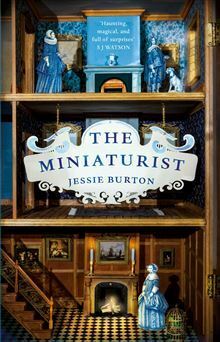 The characters were really well written and I especially loved the anonymity of the miniaturist. And to make it better, there were tones of really unexpected twists all throughout the story. The ending was probably the biggest twist because, although the clues were there, I didn't pick up on them and was just gobsmacked. The ending was so good and I'm kinda sad I finished it. I really, really enjoyed this book and I recommend it to anyone that enjoyed fantasy or novels with lots of mystery. This is not only a YA novel but is perfect for adults as well so I encourage everyone to read it. The main reason I picked it up is because the cover is stunningly beautiful and it's part of Richard and Judy's Book Club! Overall, this is an amazing book, one I would certainly re-read, and I'm definitely looking forward to reading more novels by Jessie in the future! Ohmygod Jennie, I've been dying to get my hands on this book!!! Glad you loved it! I need to hunt this book doooown! It's so good omg I can't wait to hear what you think!